I am feeling really good this week because not only did I make great strides on my to-do list, I even added an item and completed it, as well! It’s time for another To Do Tuesday over at Stitch All The Things! 1. Finish the LARP Formalwear dress, take pictures, and write TSNEM post. After last week’s list, all I had left to do was set the sleeves and hem the dress, which are now done, and it is FINISHED! I am thrilled with the final dress, beading and all – it is exactly what I wanted it to be. I took a few pictures of the finished dress for this post, but I did not get pictures taken or the TSNEM post written. I actually have a photo shoot scheduled for this coming Sunday in the mountains to get really nice pictures for my TSNEM post and just for fun, so that part of my list will have to carry over to next week along with pictures for this post. 2. Draft Pattern, Bead, and sew a Kokoshnik to wear with the LARP Formalwear dress. 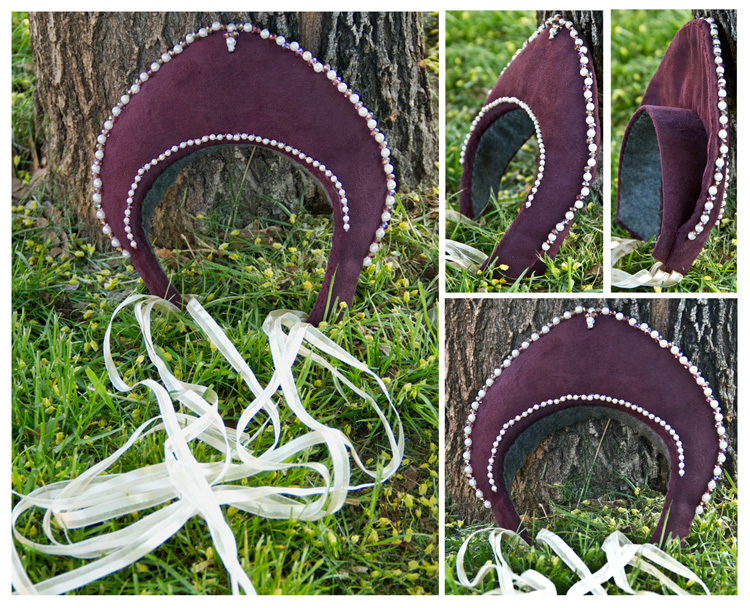 When I found out it was going to be another week before I was able to take pictures of the LARP dress, I decided I had plenty of time to create some sort of headdress to go with it. After researching several options, I settled on the Russian Kokoshnik because it could be made relatively easily from materials I already had on hand. I am writing a post about the process of making it, which ended up being easier than I initially expected (the link will work when the post goes live). 3. 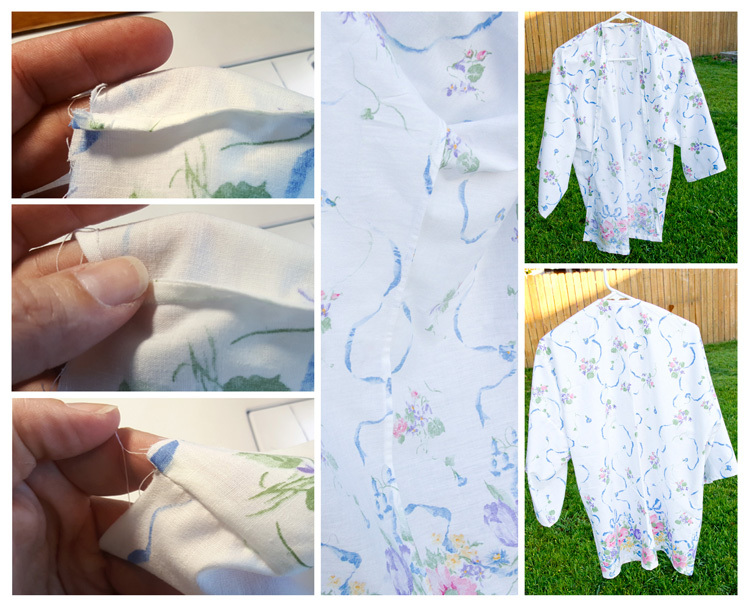 TSNEM: May – French Seams – Florence Kimono – I wasn’t sure if I would like to wear this kimono or not, so I made what basically counts as a muslin out of this Daisy Kingdom fabric, and I used French Seams wherever possible. I actually really like the fit, and I think with a fabric that has more drape it will look really nice. For now, though, I feel like this one looks more like a hospital scrub jacket (oops, lol). At any rate, it is a really easy sew, and French Seams weren’t nearly as hard as I anticipated. 4. Custom Burp Cloths – I know several ladies who are pregnant and close to having their babies, and I am making them burp cloths following this tutorial from Simple Simon and Company. Unfortunately, though, I was not able to get to these this week, so they’ll move along to next week’s list. 5. 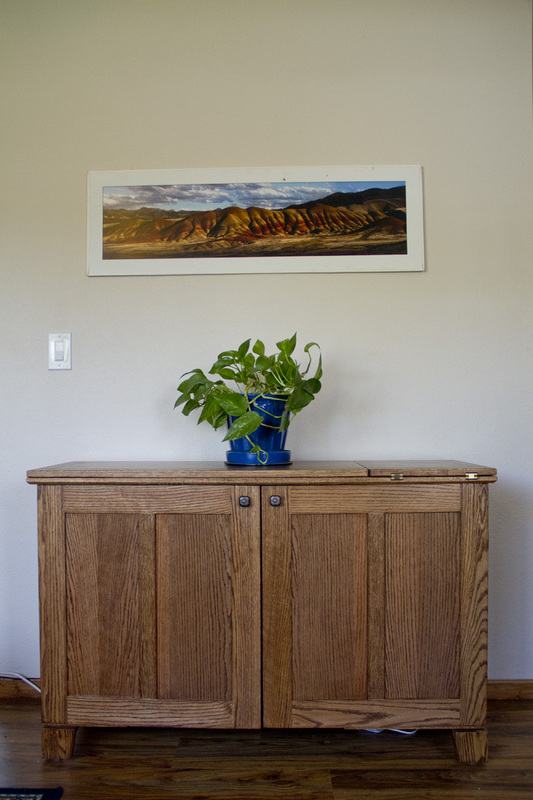 Sewing Cabinet – My dad built me an AMAZING sewing cabinet, and I finally got around to taking pictures and writing about it! That post is scheduled for later this week, so the link will work after the post goes live. I seriously drool every time I go to work at my machine – my dad is an amazing craftsman, and I am very fortunate to have several pieces of furniture made by him. This cabinet tops my list, though, for sure! 3. Turtle Pincushion Duo – I did start on these, but after working on the smaller one for a little bit, I realized it was going to take way more patience than I had at that moment, so I am putting them off another week. 4. Emmaline Bags The Retreat Bag – I did not get to these, either, so I’ll move them along to next week, as well. They are a project that is in the “I’ll get to it when I get to it” part of my brain, so I don’t mind not finishing them. I am really happy with everything I got done this week, especially since I added another project to my list and not only did it include hand beading, I had never made a headpiece before! So, for next week, after I roll over the incomplete items from this week, I have four things to finish. In addition, I am adding a couple new items that I need to work on. 1. Custom Burp Cloths – I know several ladies who are pregnant and close to having their babies, and I am making them burp cloths following this tutorial from Simple Simon and Company. 2. Take pictures and write hand-beading TSNEM post with the LARP Formalwear dress. 5. On The Go Bags Airport Sling – I have had the fabric for this bag set aside for quite a while, and I think it will make the perfect summer bag! Plus, the authors of the book are having a Sew-A-Long with prizes which is motivation to get the bag finished! 6. Florence Kimono – I am adding this back to my list because I need a wrap or shrug of some sort to wear over my dress for Emma’s wedding, and I think this pattern will work perfectly! 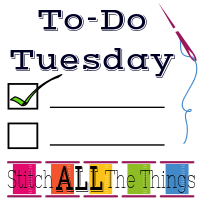 Linking up with To Do Tuesday at Stitch All The Things! 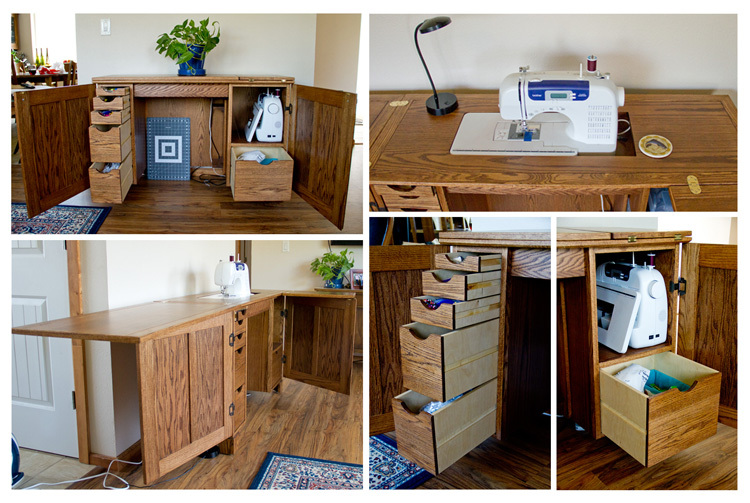 Ok, I just have to jump right to that sewing cabinet and say Wow! You are one blessed gal! Your father sure is gifted in fine carpentry! What wonderful storage in a beautiful piece of furniture! Yay! for you conquering French seams! Your sewing is lovely! Thank you, I definitely don’t take my dad’s skills for granted! I am very lucky! The French Seams were so much easier than I expected; I have no idea what took me so long to try them. I am very lucky, and I definitely don’t take my dad or his skill for granted! I am nearly finished with the burp cloths I was making, and they really are the easiest! Your dad’s skills are off the hook amazing! That is a gorgeous sewing cabinet! I’m drooling all over my keyboard! Your headpiece is beautiful. I hope you’ll have someone take pictures of you when you’re in costume, I’d love to see the whole ensemble! Your costuming skills are off the hook too! I’m hoping you are having a productive and happy week! Thank you, Christine! I am truly lucky to have many pieces of furniture my dad made. The funny thing is that it is “just” a hobby to him. Professionally, he was a biology professor at our local university! As a matter of fact, my friend, a fellow photographer, and I are going out to the local hiking trails Sunday morning to take pictures of the whole ensemble, including elf ears! I am super excited! Can’t wait to see you sew all the things!